The championship window is rarely open as long as you’d like or expect it to be—just ask the 2014 Red Sox. And the current defending World Series champs can see it coming. In the next two to three years, Boston is going to have to worry about the following players hitting the open market: Chris Sale, Rick Porcello, Xander Bogaerts, Mookie Betts, Jackie Bradley Jr., potentially J.D. Martinez, if he opts out. But not yet. 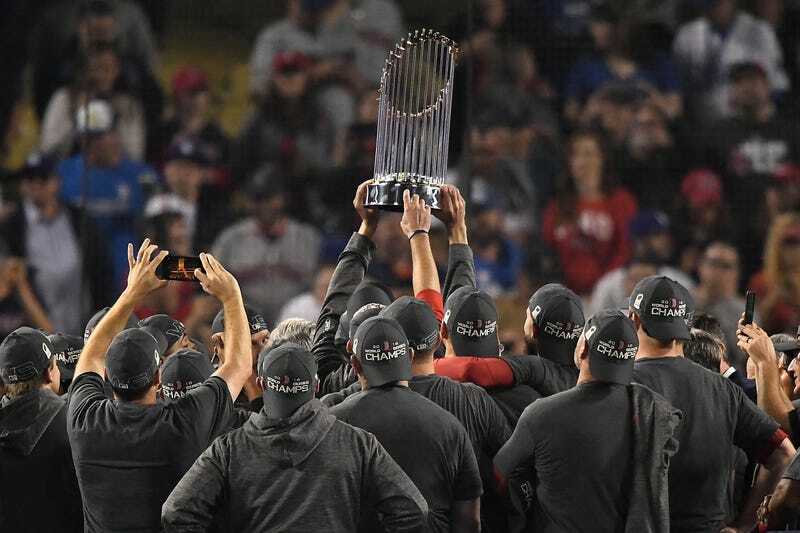 The Sox will have what was indisputably the best team in baseball back together for at least 2019, and will likely enter the season as favorites to repeat. Which makes these reports odd. There would be logic in, say, using the money they’d otherwise spend on middle-of-the-rotation-guy Rick Porcello on a couple of top relievers, as that was Boston’s only glaring weakness last season. There’d be even more logic in keeping Porcello and just signing those relievers anyway. That would be the best team it could be. But baseball teams, even the most expensive and most talented ones, are not trying to be the best they can be, and for that, blame MLB’s Competitive Balance Tax, which has one hell of an Orwellian name. (“Legalized collusion” would be a more accurate one.) As nicely spelled out here, it’s a salary cap, despite the name. If it weren’t, why would two of the three teams who were over the luxury tax threshold last year have fought so hard (and successfully) to get under it this year? Why would only two teams out of 30 be projected to be over it in 2019? The Red Sox will be one of those teams, pretty much no matter what moves they make. There are three separate luxury tax thresholds, with increasing penalties ranging from money to a drop in the draft order. Boston—again, already prepared to pay some luxury tax—is concerned about hitting the highest threshold. What exactly are they trying to avoid? Tom Verducci does some math, and concludes that the difference between where they are now and where they might trade away useful players to avoid being is: An extra $4 million in tax payments, and their 33rd overall draft pick becoming the 43rd overall. That’s it. That’s all. That would seem like nothing; a team as profitable as the Red Sox, you’d assume, would happily pay that in order to keep together the core of a championship team. Yes, the luxury tax gets more onerous with each consecutive year you’re over it, but with so many big contracts potentially coming off the books after 2019 and 2020, it’d be very easy to get under the threshold then, simply by attrition. When the championship window closes naturally, in other words. But that’s not what baseball is anymore. Any team that doesn’t want to be subject to the natural cycle of things—compete, rebuild, compete, etc.—has to begin rebuilding even while it’s competitive, even while it’s a World Series favorite. That leads to absurd things like a team weighing the possibility of trading Jackie Bradley, who’s still got two arbitration years, for younger, potentially worse players because they have even more years of team control left. Or trading away a perfectly effective No. 3 starter, in a sport where no team has enough starting pitching. This is life with a salary cap. It’s frustrating, and I’m not sure who who exactly is served by it besides owners who now have a partial excuse for not spending more. (It certainly doesn’t serve fans of small-budget teams, because if the Red Sox step back, that just opens things up for the Dodgers or Yankees or Nationals or some other team with a $200 million payroll.) Boston is still the favorite in 2019, but it appears at least open to the idea of worsening its own odds.